Aimed at assisting UGC NET aspirants at every step of their preparation, we, at Exams Planner, have come up with a well-designed e-book which would help you practice more, score better. 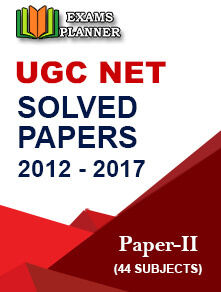 The UGC NET Paper II e-book consists of 97 papers and we have worked on 44 solved papers and have made them available for you. Since this e-book has solved papers of 2012-2017, you will find only the previous format Paper II and Paper III questions and answers. Now UGC has scrapped Paper III. Available in PDF format, the e-book contains materials that would definitely sharpen your problem-solving skills and inculcate confidence in you to take the exam. The available subjects are mentioned below. Students can simply select the required subject from the dropdown and buy the e-book. After successful payment student will receive the e-book in the PDF form on the registered email.